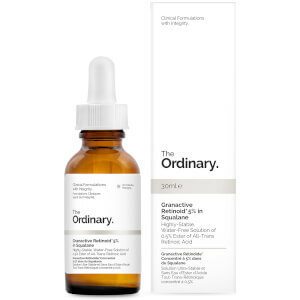 Combat signs of ageing with the Granactive Retinoid Serum 2% in Squalane from The Ordinary; a water-free solution proven to revitalise skin and soften the appearance of fine lines and uneven pigmentation. Enriched with a 2% concentration of an advanced retinoid active complex called Granactive Retinoid, the lightweight serum improves the moisture balance and elasticity of the skin that leads to a firmer, younger looking complexion. Antioxidant Squalane prevents UV damage and the formation of age spots whilst counteracting harmful bacteria, leaving you with flawless skin. Free from water, alcohol, silicone, nut, gluten and soy. I've been using this facial serum for a few months, and it has worked wonders for me! As someone with combination skin, it can be hard to find a serum that doesn't dry my face out or make me more oily, but this one is the perfect balance. I love the refreshing feel it gives your skin and the extra boost it gives your skincare routine.